Here’s what I like about pickling, it’s a pretty simple process that doesn’t require a whole lot of work. Once you get your brine mixed up and add whatever it is you’re pickling, time does the work for you. And don’t think that vegetables are the only things you can pickle. That would be a terrible mistake. Because pickled shrimp is something that you should try. Especially on a hot summer day when it’s too miserable to even think about turning on a lightbulb, let alone the stove or oven. Ok, so you do need to bring a pot of water to a boil for just a few moments, but the rest of work happens without you lifting a finger. Don’t be like me and forget that this needs to sit in the fridge overnight. I found myself prepping everything late at night, when I really had no business doing anything other than removing the cat from his preferred napping spot on my pillow. Late at night I tend to miss details, like adding ingredients. Of course, I didn’t realize this until later. 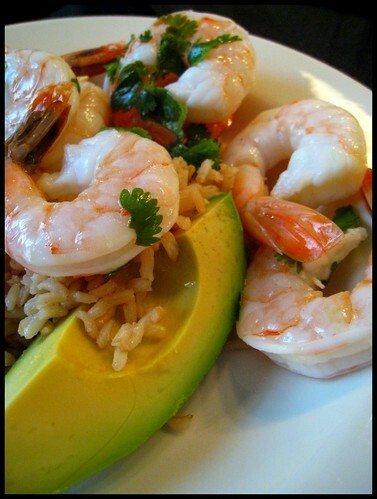 As in the next day when I served up the pickled shrimp with some brown rice and sliced avocado and thought that it needed more flavor. That’s when I looked at the recipe again and saw things like “cumin” and “…2 chiles”. Yeah, that would have helped. Despite the shrimp being a bit underseasoned in general, the parts that had been in contact with the chili seeds were packed with flavor. I couldn’t find serranos so I used small, red hot peppers. I usually don’t like a lot of heat but next time I will definitely be throwing a second pepper into the mix. Yeah, and some cumin too. So much for cooking late at night. In a large pot of water, add cayenne, bay leaf, and 2 tablespoons salt. Bring to a boil and then add the shrimp. Cook for one minute, drain, and run cold water over the shrimp. Add shrimp and the rest of the ingredients to a one gallon plastic storage bag. Add 1 cup of water (or as much as needed to cover the shrimp), sprinkle in a bit of salt, and refrigerate overnight. Remove shrimp from brine and serve cold as an appetizer or main dish. As my husband says, they are tasty. And as I say, not a lot of work either. I do recommend using as much heat as you can stand with regards to the chile peppers. One little red chile just wasn’t enough…and this is from someone who doesn’t like hot/spicy. Dish Diva, the pickled shrimp really make a lovely meal. They’d be great as party appetizers too.